Do you ever wonder how some of those winter vegetables fit into a raw food menu? You’ve had kale chips and smoothies, juiced your beetroots, and grated carrots and sweet potato, but what inspiration is left for turnips, parsnips and so on? You might as well cook them, right? Or ignore them altogether? No no, there is another way! With a bit of help from the food processor it is possible to make delicious pates mixing vegetables, nuts or seeds, and seasonings. These pates, which will keep for afew days in the fridge, contribute to a very hearty and filling main meal. As you will see from this recipe, nuts make up less than half the ingredients weight so you don’t have to worry about overdosing on these. There are no hard fast rules for this recipe and it can be adapted to include different nuts/seeds or vegetables. It aims to have a combination of all the flavours which in balance make for a delicious meal (salty, sweet, sour, bitter, spicy), however feel free to substitute any of spices, herbs, tastemakers for something you prefer. The quantities of herbs and spices used in this recipe don’t create dominating flavours, so adjust the amounts to your taste. The ideal way to serve this pate would be wrapped in a coconut wrap or nori roll with finely sliced vegetables and sprouts, or spread on a leaf such as endive, or on pieces of bell pepper. Drain the soak water from the walnuts and allow to air dry. Peel and chop the turnip. Rinse and trim the stalk of the mushrooms and allow to dry. Place all ingredients together in the food processor and mix until everything is very well combined. Occasionally stop the machine and scrape the sides down so that all ingredients are equally processed. The goal is to have as homogenised as possible thick paste. It can be made extra smooth and creamier (if you have the time to take an extra step), by feeding the processed mix through a slow juicer which has a homogenising function such as the Greenstar, using the blank screen. Serve on leaves such endive, or slices of bell pepper. Feel very nourished. 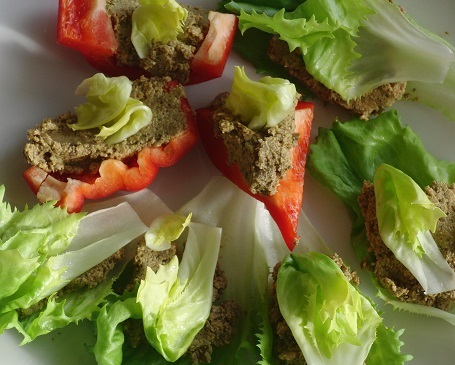 Form your pate into burger shapes and dehydrate.